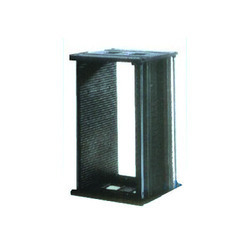 We offer quality range of ESD safe work area that includes Conductive PCB Plastic Rack, Conductive PCB Magazine Rack, Interconnecting Wire, Field service kit, Imported PVC Tiles etc. Anti Static non-slip gloves made from 100% polyester, continuous less-linting filament knitted with carbon fiber and PVC dots on palm for better grip on precision components and parts, PU coating on palm side ensures better grip. 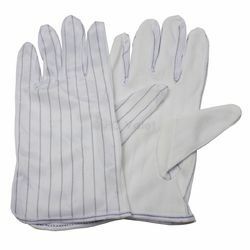 Back of glove made from low lining polyester with carbon fiber for ESD protection. Excellent sweat absorbency and good ventilation. 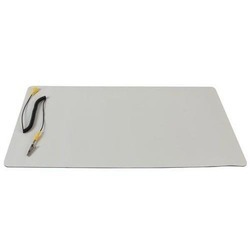 • Antistatic Vinyl base material used for seat & back with FR properties. • A additional attachment of a brass chain clamped on the bottom of the chair for additional grounding purpose is also provided. • Clean room compatible. • Pneumatically Operated. • Chrome base for foot resting. • Meets the ANSI ESD S2010.2007 and EIA 625 Standards. 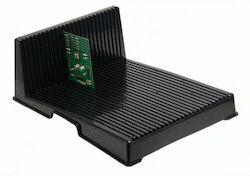 Anti Static Vinyl Chair: ESD safe chair is essentially designed for discharging the accumulated electrical charges for the operator during critical electronic assembly. 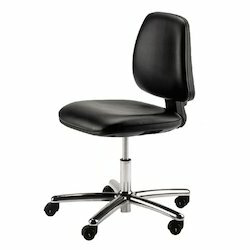 Antistatic Vinyl base material used for seat & back with FR properties. Chrome base for foot resting. Meets the ANSI ESD S2010.2007 and EIA 625 Standards. 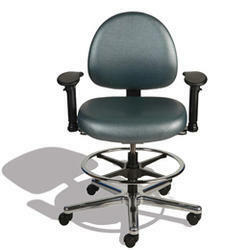 Antistatic Chair : Surface Resistivity of seat & back to the Ground 10^10 - 10¹º Ohms. Antistatic Chair : Surface Resistivity of seat & back to the Ground 10^10 - 10¹º Ohms / Sq. The Top & Bottom Boards are made of plastic / metal gear track type easy to operation. The damage of electrostatic discharge is much serious and many of the incidents including damage to super integrated circuits in semi-conductor production lines and loss of valuable data from malfunction of computer as well as inadvertent ignition of inflammable and explosions and contagions in hospital and post operation have been proven to be the results of electrostatic discharge. The cause of electrostatic discharge damage is that when two objects with electrostatic charge come into contact or friction causing electron movement occur with electrification to positive and negative poles, which are stationary at the points of mutual contact. A direct action against these points causes instant electric discharge resulting in damage to products or pollution or malfunction by sticking to the surface of charged body of opposite polarity. In order to prevent the damaged caused by electrostatic discharge, both UL and NFPA strongly recommend the use of conductive floor. 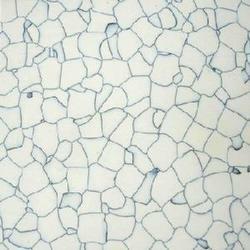 ESD Work Vinyl tile is a high tech material that satisfies their specification requirements completely and is necessary in the environment of up-to-date industries and living.